The VELOCIPEDE up to the present has been a luxury for the few; it will speedily become a necessity for the many. To meet this efficiently, a good article at a low cost is essential, and this is what is now for the first time offered. In selecting a Velocipede it should be observed that the article is worse than useless if badly made, and many of the cheap ones offered in the market are open to this observation, being the veriest rubbish conceivable. As very great strain is frequently produced in the various working parts, it is necessary that they should be finished and put together with the greatest mechanical skill, and in these respects Messrs NEWTON WILSON & Co possess facilities that cannot be excelled by any other house in the trade. Every Bicycle is absolutely warranted, and the finish of Nos 6 and 7 will be found far superior than anything yet produced. The popular press were quick to lampoon the new machines. This museum is dedicated to the ‘safety bicycle’ which was introduced around 1886, and popularized cycling. A safety bicycle is motivated by pedals with chain to drive the rear wheel. 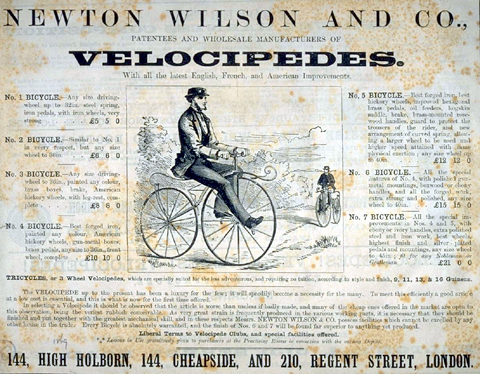 The velocipede, with direct drive on the front wheel, is its ancestor. It’s interesting to compare the two styles, and also to compare the cycling craze that resulted from the invention of each. The standard of workmanship on this velocipede is much higher than most. The flowing curve of the frame is particularly interesting. The wheels and hubs are superb. The top spring and saddle have been replaced at some time in the past 143 years, but the rest of this historic machine is original and in excellent condition. 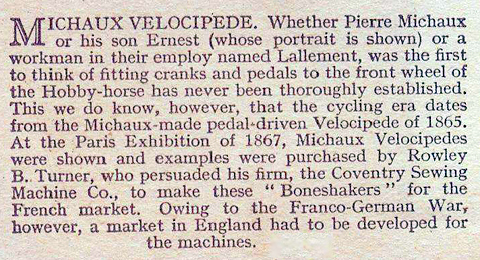 It is surprising how many different manufacturers and styles of Velocipede existed in 1869/1870. I’ve examined over a hundred pictures so far to identify this machine. The curve of the frame is so distinctive that’s it’s easy to dismiss nearly all I’ve seen …except the Hennings, below, which is similar. I know nothing about German boneshakers, so at the moment I’m doing more research in that direction. I’ll update the photos and add a video when the pedals and brakes are ready. This type of velocipede is one of the first bicycles, pre-dating the Penny Farthing. In France, Ernest Michaux is considered the ‘father of the bicycle.’ He and brother Pierre added cranks and pedals to improve the earlier Draisienne bicycle. Though Pierre Michaux created much interest in France and America with this new-fangled ‘velocipede’ the Franco-Prussian war of 1870-1871 hit French bicycle production at a vital time, with bicycle factories turned over to manufacture of armaments. British manufacturers soon took over and British machines outnumbered those from other countries. The International Velocipede and Loco-machine Exhibition at Crystal Palace in September 1869 saw over 200 machines, from Britain, France, Belgium, Germany and America. 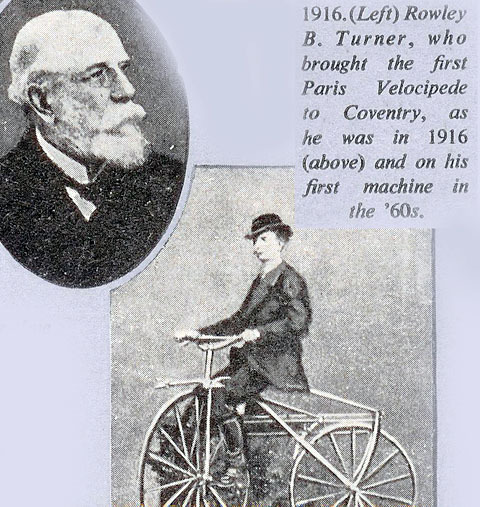 By 1885, James Starley had turned the velocipede into the ‘safety bicycle’ which is essentially the design of bicycle that endures to this day. Being a bicycle that was eminently usable, the velocipede soon captured the public imagination. The weekly satirical magazine The Ferret lost no time in adding to comments of the day. 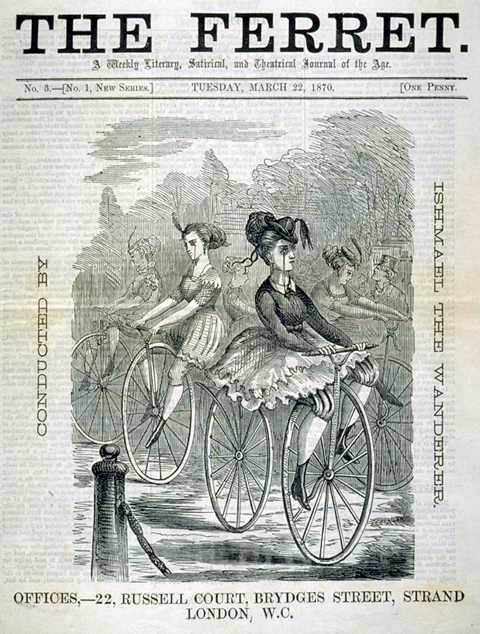 Its cover of March 22nd, 1870, illustrates women riding velocipedes with extremely risque attire. The picture below, from The Illustrated London News of 1883, is well-known. At first the press did not fully appreciate the achievements of this new machine and what it meant for the future. However, soon everyone started to recognize the importance of this new mode of transport – a velocipede may have been expensive, but it did not need food and stabling like a horse. And it could be used for independent long-distance travel. It required athletic abilities for long journeys, was dangerous down hills, and it scared the living daylight out of other road users and pedestrians …but a velocipede is actually surprisingly reliable. 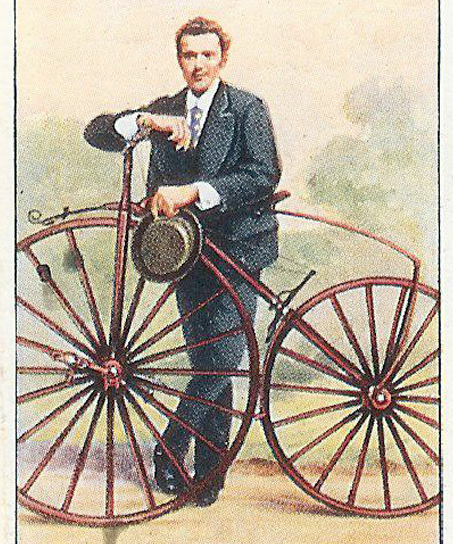 The new bicycle trade flourished and velocipedes were raced extensively. In France, even women raced velocipedes. 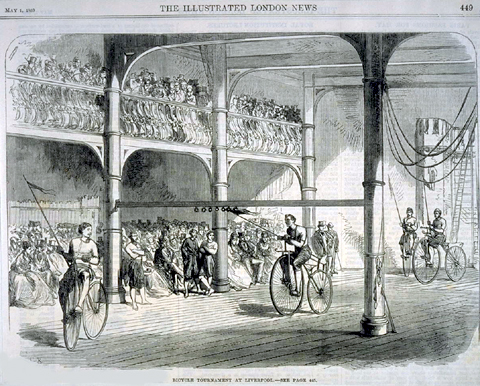 Below you can see the first ladies’ velocipede race (Le Monde Illustre, 1st November, 1868). The ‘diableries’ are a contemporary series of stereoview cards using plasticine to create devilish scenes. You can imagine Victorians in their parlours in the 1860s viewing such images on their stereoscopes in the same way we’d watch ‘Wallace & Grommit’ on TV today. UPDATE MAY, 2013: Like 99% of the surviving machines, the manufacturer of this velocipede was unknown. After considerable research, I found the closest style of frame, that of the German company Hennings. I did not intend selling it, but one of my best friends wanted it, attracted in particular by the original wheels. He has now done considerable work on it to prepare it for riding. I’ll add a new photo in due course.